I re-started my lipstick a day project last Thursday, and I've now worn 6 lipsticks from my current collection. 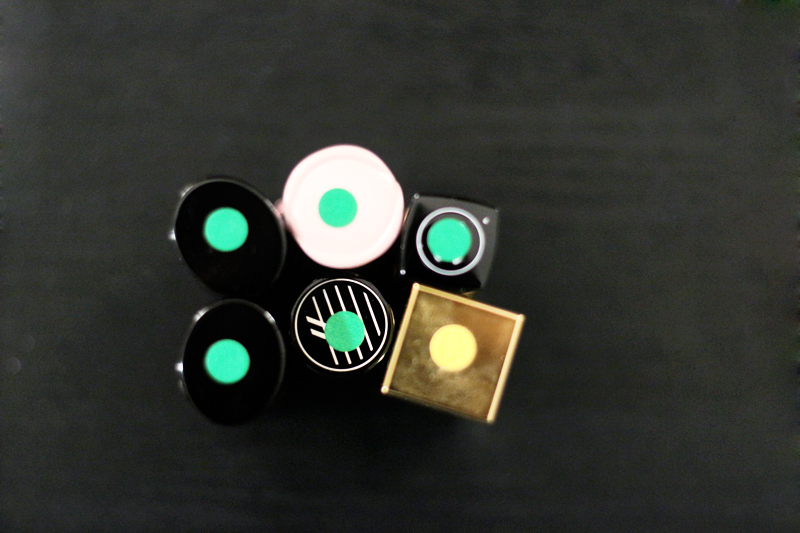 The green dots indicate the lipsticks I'll be keeping in my collection, and the yellow dot marks the lipstick I'll be re-testing in a future episode in this series. I'm having so much fun wearing a different lipstick every day. My collection seems new to me again, and this is a great project to try if you're looking for a fun way to shop your stash. I just finished editing the first episode in season two of my lipstick a day series, and I'll be posting the video tomorrow. In the meantime, I thought I would share all six videos from season one in today's blog post. These videos were filmed almost three years ago, when I had an inflated collection containing a whopping 102 lipsticks--and this was after multiple declutters! I continued to work on downsizing my collection after completing this series, and I now have around 25 lipsticks remaining in my stash.